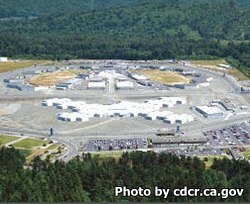 Pelican Bay State Prison is located in Crescent City California and houses the most dangerous maximum security offenders. Part of the facility is used to house inmates in a general population setting, although they are all maximum security offenders. The other part of the prison, approximately half of it, houses inmates in the SHU or security housing unit. The SHU is for inmates who pose a serious threat to inmates and staff alike, and is reserved for those inmates who are extremely difficult to manage. This facility also has a minimum security facility, which houses non-violent offenders, located just outside the perimeter fence. The inmates in the minimum security facility offer operational support to the main prison. Because Pelican Bay is considered a Super-Max facility the inmates in the SHU are locked in their cells for 22 hours or more each day, and given a court mandated 20 hours per month of outdoor exercise. The entire facility currently houses over 3000 inmates. This facility is often referred to in movies and television as it has earned a notorious reputation as being one of the most dangerous and undesirable prisons to be incarcerated in. Visiting is on Saturdays and Sundays from 9am-3pm, but you must arrive before 2pm to be allowed to visit. Visitors are also permitted on four holidays (New Year's day, July 4th, Thanksgiving and Christmas day). An appointment is required for anyone wishing to visit an inmate who is only allowed non-contact visitation, such as inmates in Segregation (SHU). You can schedule a visiting appointment online here.